Mobility scooters, the electric three- or four-wheeled vehicles sometimes called electric convenience vehicles or ECVs, can help persons with disabilities travel freely without becoming tired. Because they are self-propelled, mobility scooters offer independence. Some mobility scooters can be disassembled and carried in the trunk of a car, while the heavy-duty models are intended for use with a van and do not come apart. Scooters can cost anywhere from a few hundred to several thousand dollars. For travelers with disabilities, mobility scooters provide freedom of movement. The scooter user controls speed and direction. Crowded areas and sidewalks without curb cuts can present challenges, as can bus and taxi travel, because some scooter models are too large to fit into a taxi trunk or work with certain types of wheelchair lifts. Scooter users must select a model that can bear their weight; lighter "travel" models can bear weights up to 200 or 250 pounds, while heavy-duty models can carry passengers weighing up to 500 pounds. If you are a traveler with mobility issues, but do not own a scooter, you may wish to consider renting one for your next trip. You can have the scooter delivered to your home, hotel or cruise ship and have it picked up there at the end of your vacation. If you are traveling by air, you can gate-check your rental scooter at most airports, allowing you to move easily from the check-in counter to your gate. Most airlines will transport your rental scooter free of charge, provided you have given them appropriate advance notice. You can rent mobility scooters from several nationwide firms in the US, including Scootaround and Scooter World. In the UK, RentaScoota and Direct Mobility rent scooters by the week. 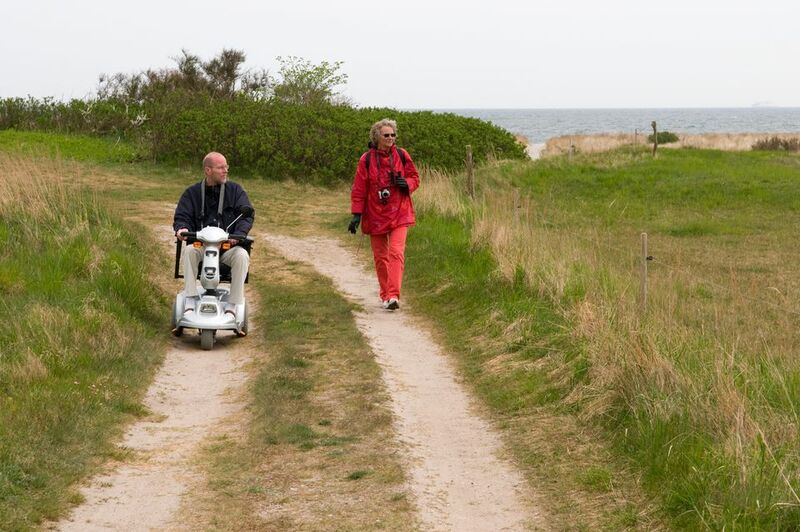 Many senior-friendly destinations feature locally-owned scooter rental firms. In Orlando, Florida, you can rent scooters from ScootOrlando / Scooter Vacations and Walker Mobility; Disney World also offers scooter rentals, although they've been known to run out of scooters from time to time. Local firms offer mobility scooter rentals in Yosemite National Park, Las Vegas, Honolulu and Washington, DC. If you are taking a cruise and want to rent a scooter, contact your cruise line and find out the dimensions of your stateroom before you select a mobility scooter. Some cruise lines ask you to keep your scooter in your stateroom at night, and you may find that certain models are too large to fit. CruiseShipAssist / Care Vacations Ltd. and Special Needs at Sea specialize in scooter rentals for cruise ship passengers; both companies deliver scooters to popular cruise ship ports around the world. Tour operators may or may not allow mobility scooters on specific itineraries; call your tour operator and discuss your options before booking your trip and renting your scooter. Similarly, certain hotels may not permit mobility scooters, so it's best to call ahead and ask about your hotel's policies and room dimensions. Once you have all the information about your accommodations in hand, it's time to call some scooter rental companies. Rates vary widely by destination and mobility scooter model. In most cases, the scooter rental company will ask for your height and weight in order to provide you with the best mobility scooter model. You will also need to provide your destination, trip length and choice of delivery and pickup locations. Some companies offer trip cancellation insurance, but many do not; if you cancel, you may have to pay the full rental price anyway. Will I need to be physically present at delivery and pickup? What happens if my scooter battery does not hold a full charge or if my scooter breaks down during my trip? What type of transformer or converter will I need to use this scooter in the countries I plan to visit? Do you provide them, or will I have to bring them myself? Do you offer cancellation insurance or scooter loss / damage insurance? If not, what happens if I have to cancel my trip or if the scooter is lost or damaged? If possible, ask friends or look online for scooter rental recommendations and reviews for your particular destination or cruise line. You may find that the rental company that best meets your needs is not the lowest-price option, particularly if you are taking a cruise.